WHY TILAPIA? READ THE HEALTH INFORMATION ON TILAPIA FISH. TILAPIA is CONSIDERED BRAIN FOOD, HIGH IN PROTEIN, WITH LITTLE FAT, BONUS OF VALUABLE OMEGA-3 & 6 FATTY ACIDS. Aquaponic farm raised Tilapia are awesome for every age, especially elderly, growing kids & pregnant women. B12 is an important vitamin for cognitive functioning & helps red blood cells form properly. A typical serving of Tilapia (4 ozs) has 2.4 g of B12 this is the amount a body needs to function properly. Tilapia is awesome for bones with what some call the “Dynamic Duo” which is CALCIUM & PHOSPHORUS. CALCIUM helps your bones stay healthy & strong while PHOSPHORUS helps both bones & nails from becoming brittle. 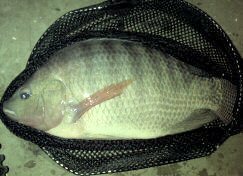 Shipping Available for Live Tilapia fish, Clean Whole Fresh Tilapia Fish On Ice or Delivered Fresh for contract customers. When shipping live Tilapia fish several things need to be taken into consideration. Two of those are seasonal tempertures & expense if shipping over nite. 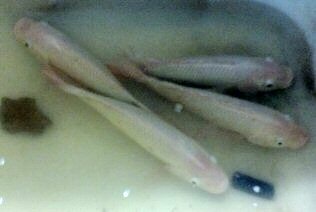 Seasonal Temperatures because of the need to keep Tilapia fish at a proper temperature, proper ammonia levels & proper oxygen levels while in shipping. 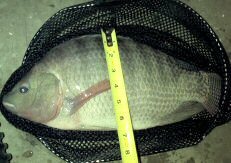 The size of the Tilapia fish & Quantity need to be taken into the equation. Order well ahead of time. Time is needed to figure best materials, do the calculations & prepare shippment, working out any thing that might come up. 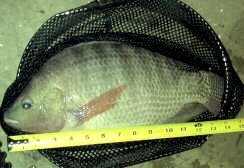 Tilapia fish are removed from feeding to purge before shipping live & recomended 4-5 days before harvesting. BREED TYPES: Tilapia is a large genus in the cichlid family (cichildae). There are several breeds of Tilapia fish listed below are a few of the more popular breeds below. 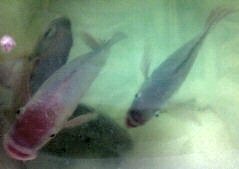 Red Tilapia fish (reddish to pink sometimes with dark spots or marks) a manmade hybrid mating a version of Mozambique Tilapia scientific name of Oreochromis Mossambicus with Nile Tilapia or Blue Tilapia. Blue Nile Tilapia fish look similar to Nile Tilapia fish but blue in appearance instead of black with the scientific name Oreochromis aureus & are more cold water tolerant. Wami Tilapia fish has a scientific name of Oreochromis Urolepis Hornorum & is better in brackish water environments & salt tolerant. RECOMMENDED COOKING METHODS: Whatever your imagination can dream up. There are numerous ways to cook Tilapia with awesome tasting results regardless of method. Suggested Cooking Methods: BROIL, FRY, SAUTEE, BAKE, STEAM, BLACKEN, MICROWAVED, FLAKED INTO FISH TACOS OR USING IN A SOUP. Tilapia originally came from Africa & considered the fish of Israel from Bible times & also known as St. Peter’s Fish. Tilapia has been an important source of protein in Africa & the Levant for thousands of years. Ancient Egyptians cultivated tilapia in ponds along the Nile. Tilapia has its very own hieroglyph. Tilapia considered sustainable due to its herbivore eating habits, feeding mainly on plankton, filamentous algae, aquatic macrophytes & other vegetable matter. Tilapia are a warm water fish preferring temperature between 75 & 90 degrees, some breed types can handle a little lower but breeding is significantly reduced if any. In 75 degree plus Tilapia breed prolifically every 34 days after recuperation. They can have as many as 10 cycles per year producing litter sizes anywhere from a few hundred up to 3 thousand. Tilapia need a PH level from 6-8 & can live up to 9 years old & weigh up to the current record of 9 Lbs. depending on environment. The average current market fillet size is 4 ounces. A unique trait of Tilapia is they are mouth breeders. The female lays eggs, the male fertilizes them, then the female picks them back up tumbling them in her mouth conditioning the eggs till they hatch.